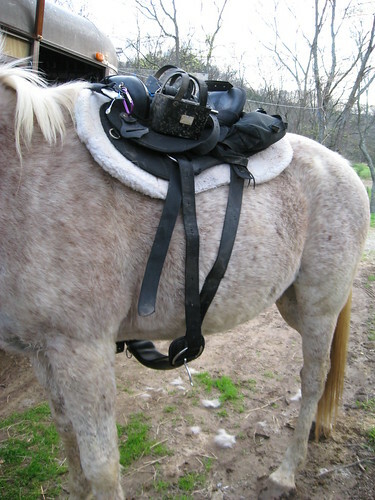 Ok, so earlier, I showed how to convert a human chest heart rate transmitter into one to use with a horse under saddle. But how to actually get that to work? I use 2 different types of girth. This post will focus on using a neoprene girth. Smooth neoprene is hands down my favorite girth material. Unfortunately, Tanna does not like it, so I have to use a fleece-covered mohair girth for him. What a prima donna! ;-) So Serts will be my model for this post. Ok, let's get started on the steps. Attach the converted transmitter to the saddle. I attach it to the D rings on the front of the saddle. Put a dollup of gel on the electrode attached to the white wire. (You can wet the hair down really well with water if you don't have gel.) 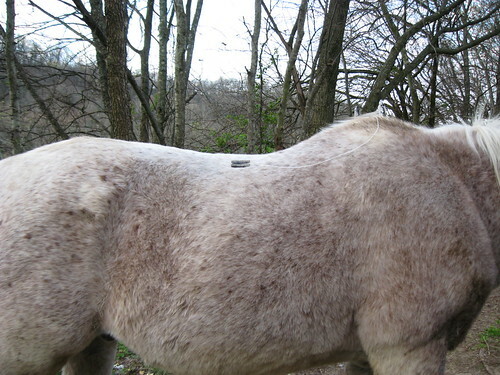 Place the electrode on the horse's back on the right hand side. 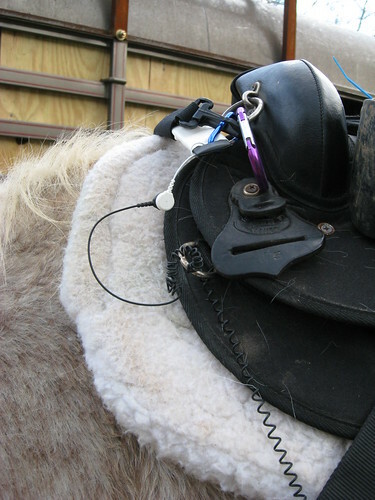 You want the electrode far enough back from the shoulder that the electrode will not drop into the hollow behind the shoulder when the horse is moving. Position the electrode down from the spine along the back muscles. 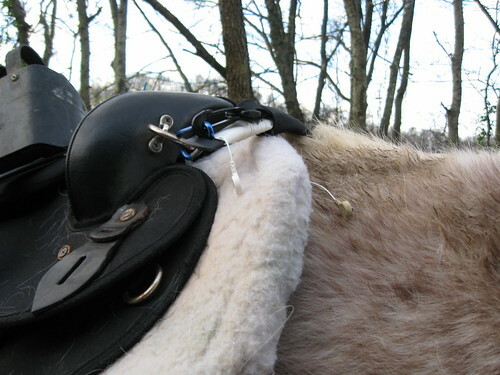 You want the bars of the saddle to firmly press the electrode against the horse's skin during work. Don't worry, these electrodes are wide and flat and my horses have never had any discomfort from having one there. Just make sure it's on the muscle, not the spine. 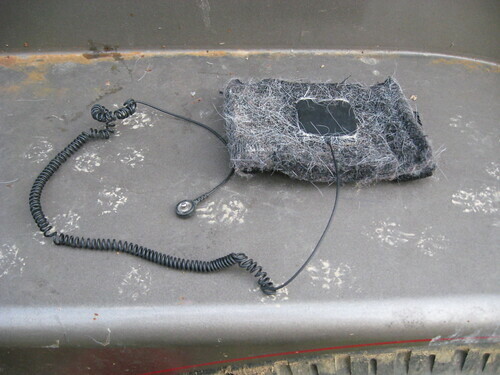 Put your saddle pad on, making sure the wire from the electrode comes out under the pad at the withers. I use Toklat woolback pads. 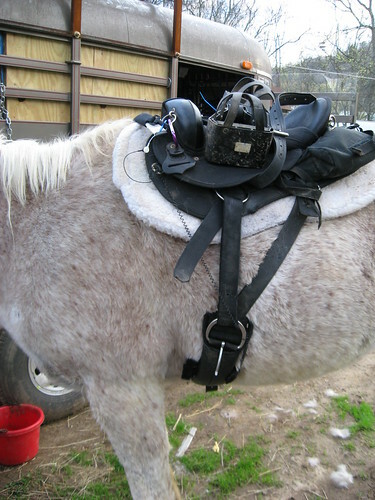 The electrodes have velcro on the back of them, so once I position the electrode and place the saddle pad on the horse, the electrode sticks to the pad. So after placing the pad on, I peek underneath to be sure the electrode is still where I put it. If so, I can put the saddle on. Snap the wire from the electrode to the pig-tail of the converted transmitter. Loosely girth up your horse, leaving plenty of room between the girth and the horse so you can work easily. I use a neoprene girth and I don't like to crank down the girth tight (Serts doesn't like it either!). But the girth electrode does need snug contact with the skin in order to work properly. So I use a large felt rectangle. It's actually a girth buckle guard I bought from Running Bear.com. Since the electrode has a velcro backing, I can place the electrode on the felt and it will stick there. Put a dollop of gel on the electrode (or again, wet down the skin where the electrode will be). 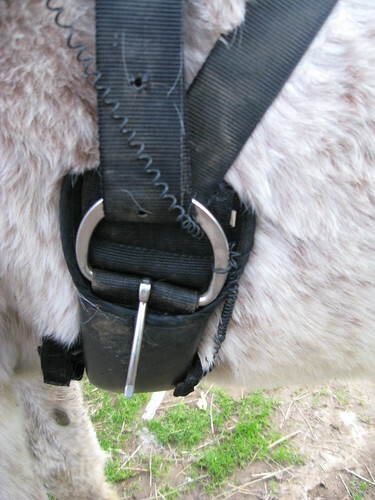 Place the felt piece on the girth on the horse's left side. When the girth is done up, you want the electrode to end up along the side of the horse where you'd take his HR with a stethescope. Tighten the girth up just enough to hold the electrode against the horse's body, but don't tighten it yet. 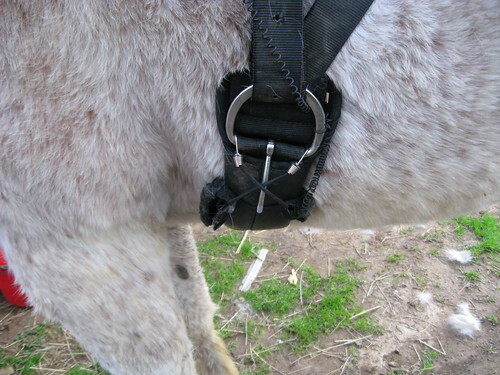 Take the coiled wire and wrap it around the girth buckle, leaving a little slack between the electrode and the buckle of the girth. Then further up, take a turn around another d-ring, maybe even the one the HRM is snapped to. I like to do this to have some stability so there won't be tugging on the electrode side or the snap side. Snap the snap to the other pig-tail. Snug up the girth to where you want it. 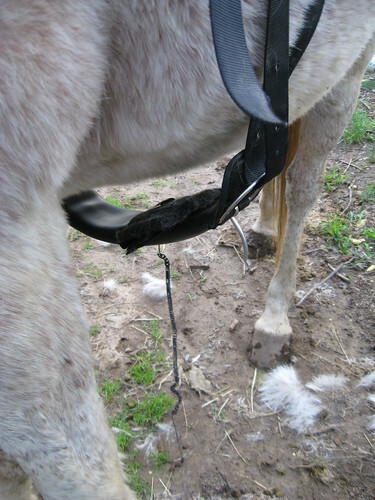 Take the bungee and thread it through the loops of the felt rectangle, criss-cross it and hook to the girth buckle. 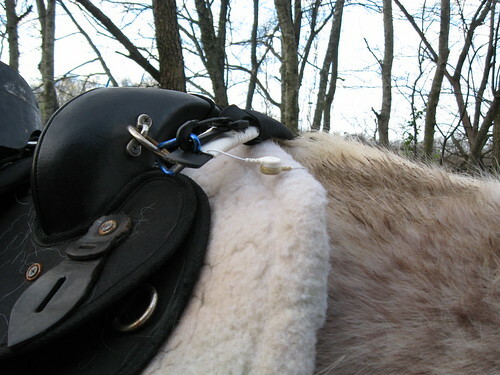 This keeps the felt piece from sliding down or falling off altogether if the girth loosens up during the ride. Worked like a DREAM!!! Thank you SO MUCH!! Now, how do you get the "watch" part to read the h/r like that?... I get it, it's just TINY in the upper right hand side... Hard to read when you're moving out... & What 'rates' are safe, what am I looking for?? Thanks for all your help! Hi, Christine. I'm glad you found the post helpful. You can change the data fields you see by going to the Menu > Settings > General > Data Fields. Choose one of the data field pages. Main 1 and 2 are always present. The others are sport-specific. So if you're using the Running sport, you can change the Running data fields that will only show when in the running sport. Once you choose the page, Main 1, for example, you are presented with a number to choose how many fields to show. You can show 1 big field, 2, 3 or 4 fields. Once you choose the number of fields, you can choose a field and press enter to change what that field shows. For the picture, I had one field and had it set to HR. 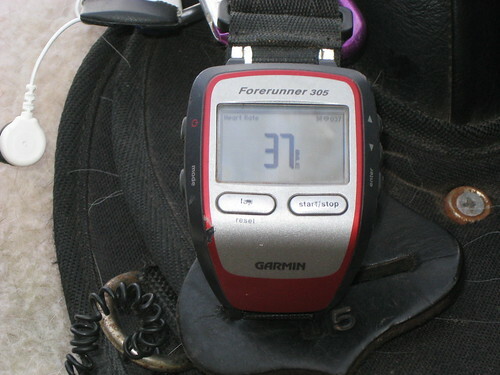 As for what HRs are safe...spend some time just observing your horse's heart rate to get a feel for him. My two horses have different HR values. Serts is blessed with low HR, but Tanna is much better conditioned, even with his higher HR. What I look for is something abnormal. For example, Tanna runs 20 - 30 beats higher in competition for the first loop than he runs normally. It's just adrenaline. But I know that's normal for him. But if he was running 40 - 50 beats higher, I might be concerned he'd overworked or hurt himself. For my boys, I try to keep their HR down under 160 roughly unless I'm specifically doing interval training. Thank you SOOO much! Your post have been MOST helpful!! And I've looked, trust me. Haven't had a chance to use the unit on Bling yet, but have on TAZ~she pulses down so fast!! That's good!! Again, many thanks! Keep posting! I use small carabiners to keep the HRM transmitter from sliding through the black cover that came in the kit. Or maybe I'm misunderstanding your issue? Nope, now I understand! Thanks so much!